Summertime and the livin’ is easy! In New Mexico, this sentiment rings especially true. Long, sunny days are a call to get outside. From stunning national monuments, to scenic chairlift rides, to geocaching, you’ll find that summer opportunities are endless in the Land of Enchantment. Here are the 10 best summer activities to do in New Mexico. Last year, this national monument was designated as a Dark Sky Park by the International Dark-Sky Association. A dark sky is viewable in a place where there is relatively little interference from artificial light. 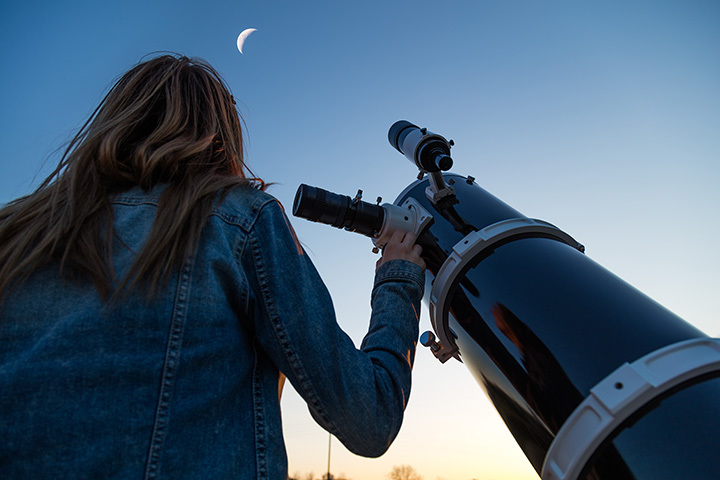 The New Mexico skies in general, but particularly here, are a panoply of constellations, stars, planets and galaxies that can be seen by the naked eye, although a telescope helps. Rangers hold night programs throughout the summer. Grab on, hang on and fly down any one of six zip lines that, of course, begin at the top of a mountain here in the Sangre de Cristo range. You might even catch a glimpse of the beautiful Moreno Valley as you skirt the treetops. Zip lines range in length from 120 to 1,600 feet. The whole experience takes about three hours and includes some hiking be-tween zip areas. Have you ever wondered how prairie dogs forage? Wonder no more. A walk on the Ref-uge’s Prairie Path will open the window to the life of the indigenous black-tailed prairie dog. But that’s not all you’ll learn about here. Drive the 10-mile scenic auto tour loop and you’ll see songbirds, hawks, owls, eagles, wild turkey, white-tailed and mule deer. The Refuge, a feeding and resting habitat for migratory birds, covers more than 3,500 acres of short-grass prairie, play lakes, wetlands and crop fields. This trail system is monitored by local Gallupians, the Gallup Trails 2010 nonprofit, that believes that accessible trails improve the quality of life. The trail is a smooth and narrow single track through diverse terrain. There are three loops that take you across First, Second and Third Mesa which get increasingly more difficult and technical as you climb. The route is fast but fun with numerous small climbs. Maps and signs are posted at trail intersections. There are mountain biking areas all over the state, but this area is a successful collaboration with other users that brings people together. Catch and release or catch and eat. You can do either at this popular fishing destination. This 15,000-acre lake is the second largest in the state. It’s a fisherman’s haven with rainbow trout, brown trout, kokanee salmon, large/smallmouth bass, northern pike, channel catfish, crappie and bluegill all for the taking with the right knowhow. Below the lake is the San Juan River with one of the most famous trout fisheries in the state that lures fly fishermen to the banks for 17 miles of action. The view is from the top of any mountain, it’s just getting to a vista point that’s difficult sometimes. In the summer months, ski resorts keep their chair lifts moving, taking visi-tors up the mountains in the warm sunshine. The scenery is awe-inspiring at the top with here views of Wheeler and Kachina Peaks. The crisp mountain air is refreshingly invig-orating. Picnic tables at the top make dining al fresco easy. Open seven-days-a-week, June through September. There’s just nothing tastier than eating a fresh-picked plum or cherry or apple or peach or apricot. Summertime fruit is sweet and juicy and mouthwateringly delicious. Nichols Ranch has been farming for more than 100 years and know how to get the best out of their fruit trees. At any given time, depending on what’s ripe, you’ll find 15 varieties of cherry, 20 acres of apples, orchards of apricots, peaches, plums, figs, pears and sugar prunes. Take a basket or a bucket and pick your own every day from 8 a.m. to 5 p.m. June through October. You don’t have to leave this land-locked state to sit at the beach. Head for these lakes located southeast of town. Sit in your beach chair, wiggle your toes in the sand, play some beach volleyball, watch the waves lap against the shore and build the sandcastle of your dreams, all the while enjoying soaking up the rays. The lakes here are really giant sinkholes that are between 17 and 90 feet deep. The bottomless feel is thanks to aquatic plants that turn the water a greenish-blue giving it the illusion of being really deep. A little family-friendly beach fun makes for a great summer vacation. What kind of outdoor sport takes you on a real-time treasure hunt adventure? Geocach-ing! These hiding spots are found everywhere. All you need is a GPS mobile device, or a mobile phone with GPS accessibility, GPS coordinates of the cache and a dose of curiosity. The locations of these hidden treasures can be very diverse, from parks to mountain tops to busy city streets to even underwater—make sure your phone is waterproof. There are some rules if you uncover a cache: if you take something, leave something of equal or greater value. If there’s a logbook, write about your discovery.